Australia's native forests store three times as much carbon as previously thought and could hold the key to tackling climate change, according to a researchers. 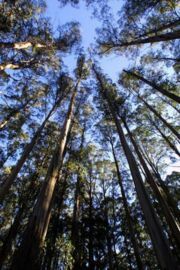 A report released in August 2008 has found the eucalypt forests of south-east Australia - stretching from Queensland through NSW and Victoria and into Tasmania - store the equivalent of 25.5 billion tonnes of greenhouse gases. The report also makes the point that leaving forests already logged to regenerate and regain a maximum carbon content is preferable to logging them again like plantations - which results in more carbon emissions. Eucalypt forests of south-east Australia - stretching from Queensland through NSW and Victoria and into Tasmania - store the equivalent of 25.5 billion tonnes of greenhouse gases. The Intergovernmental Panel on Climate Change estimates such forests held 217 tonnes of carbon per hectare, but the ANU report found Australia’s forests stored an average of 640 tonnes per hectare. In some areas, forests stored 2000 tonnes of carbon per hectare. Protecting these immense carbon stores - both in Australia and worldwide - is the cheapest and quickest form of emissions abatement available. This page was last modified 23:03, 13 March 2011. This page has been accessed 15,059 times.